The focus this year is all about creating aspirational spaces, based on how people want to feel. For me design has become more about creating an experience and no longer only designing environments. The world is an overwhelming place and people are living in smaller spaces. In order to counter the freneticism, clutter and lack of individuality, I am intentionally curating spaces for my clients that encourage mindful living – spaces that facilitate self-nurture and which encourage recharging. 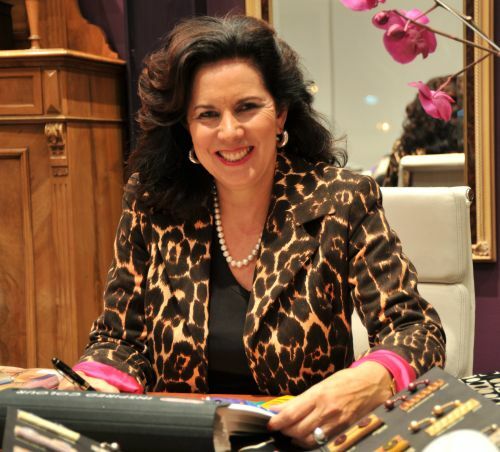 This lifestyle movement is about respecting oneself and one’s belongings by replacing clutter with items which reflect my clients’ individualism and invoke a sense of joy. Clients want their spaces to be a place of safety and intimacy and personalised, so there is a movement towards warmth, comfort and relaxation, rather than extravagance. As a designer I focus on bringing out my clients’ personality and I create spaces that make them feel relaxed, energised or intimate. There are no pre-determined set of rules, which gives designers and architects freedom in creating spaces that emphasize the importance of getting insight into clients’ individuality and diverse needs. In music, rhythm is characterised by movement, by the regulated succession of similar and opposing elements. The beauty of creating rhythm in interior design is that this can have a hugely beneficial effect on the quality of people’s lives. Spaces will therefore incorporate soothing, flowing rhythm, and can be complemented by a more demanding and progressive rhythm. The creation of beautiful spaces is about encouraging our clients to find their personal rhythm between much-needed quietness and the joyfulness of deliberate movement. It’s about flowing with this rhythm which leads to a life of passion, purpose, energy, fulfilment and inner joy. This year, more is more when it comes to the use of colour. 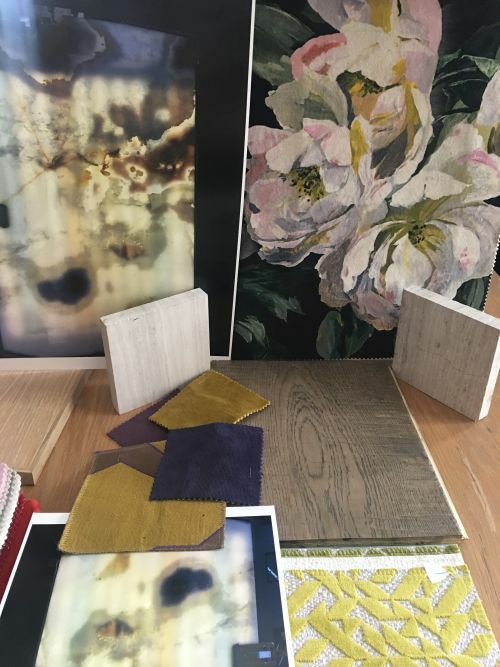 The trends for 2018 have been anything but neutral tones – it’s a year to push the boundaries of pattern and colour, something which personally resonates with me since I have a deep love for creating designs with bold colours and patterns. This colour trend will continue into the future. Preferences have shifted from neutral, comfortable pallets to bold colours such as orange, saffron, millennial pink, teal green, violet and yellow. Teaming these colours adds such effervescence to a scheme. Holding centre stage has also been warm and earthy tones – red, turmeric, mustard, yellow and papaya. Calmer tones such as sage, celery and avocado green have not been forgotten, and are used in the background to strike a balance of strength and delicacy. The enigmatic Klein blue and purple tones are also very prominent in design this year. Wall art is currently very important and will be in the future. This trend takes the form of extra-large pieces of art, bold-patterned wallpaper or a wall clad in an interesting piece of marble or onyx. These bold statement pieces form the focal point of a room. 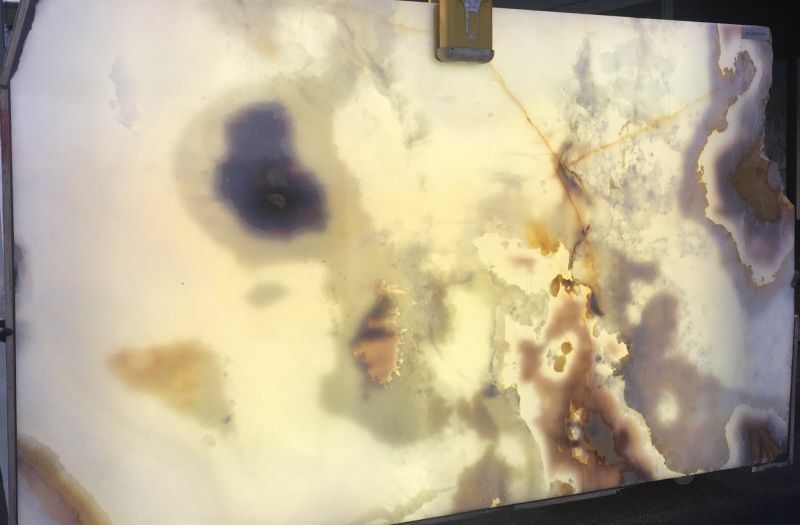 As an example, the focal point of the DVR Decorex Designer Spotlight stand was the brilliant, 2,8m x 1,7m fiery onyx slab supplied by Rudi’s Choice Marble and Onyx Collection, flanked on both sides by marble slabs from International Slab Sales. The onyx and marble were installed by Natural Stone Design. The onyx was cleverly backlit by Streamlight. 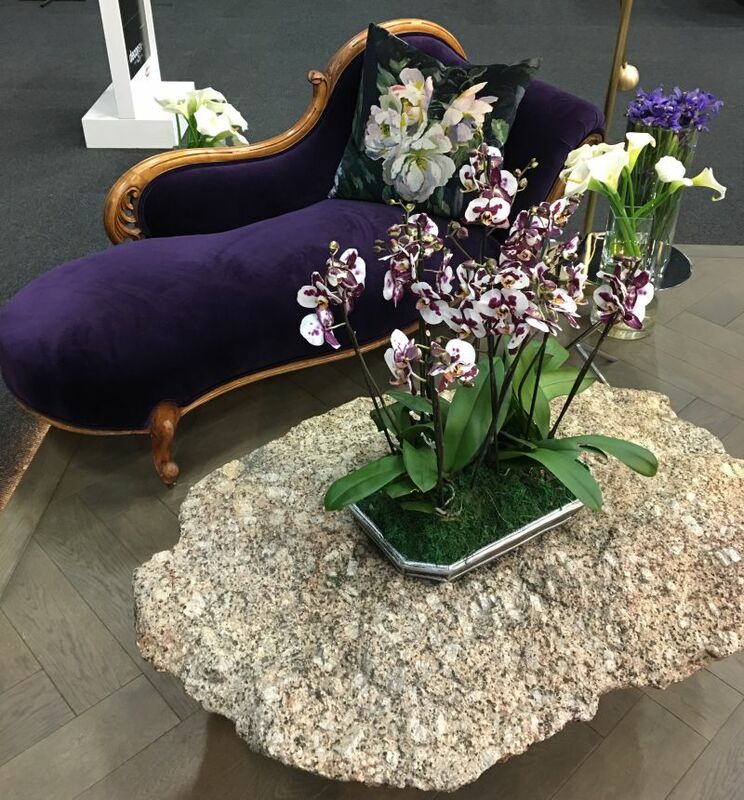 Onyx is a very unique natural stone which is making an impact in the luxury design field. It is regarded as a precious stone because of its rarity and is renowned for its vividness and elegance. Metals are incorporated in all areas from lighting to furniture, kitchen and bathroom fixtures, but especially in lighting. Specifically, brass has made a comeback and has overtaken copper and rose gold. In furniture we see a fusion of walnut, copper bronze, brass, satin brass, gold and black nickel all working together to create a sophisticated feel. I choose one dominant metal in the scheme and I use the others as accents, visually pulling the scheme together. Metallic handles and furniture legs, for example, add glamour to a design scheme. Geometric forms are still very much with us, especially in flooring. They have a modern simplicity, but are familiar and create a strong presence. I used a herringbone pattern from Forest Flooring on my Decorex Designer Spotlight stand. 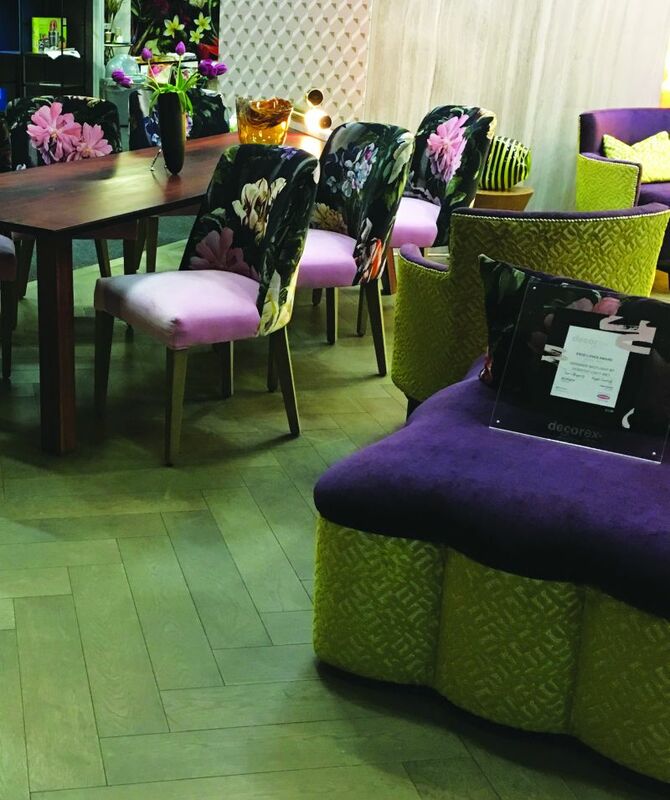 Furniture and dark wall cladding will continue to be popular in 2019, showing a resurgence for retro glamour. Texture will continue to be a huge trend in 2019. This can be seen in both fabrics and furniture such as featured by Minotti and Hermes at the Milan Fair. 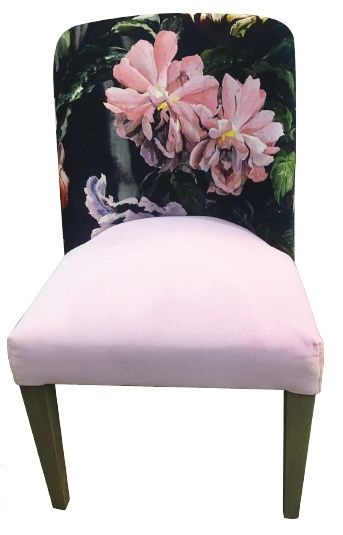 Furniture has a natural handmade feel, while textures have lots of embellishments and raw edges, all wonderful to the touch, adding to the ethos that design should be about experience. Shapely furniture has overtaken the plain neutral pieces and there is a celebration of furniture reflecting the uniqueness of the inhabitant’s personality – unique, handcrafted, captivating furniture with intricate decorative details. Statement sofas have made a comeback. 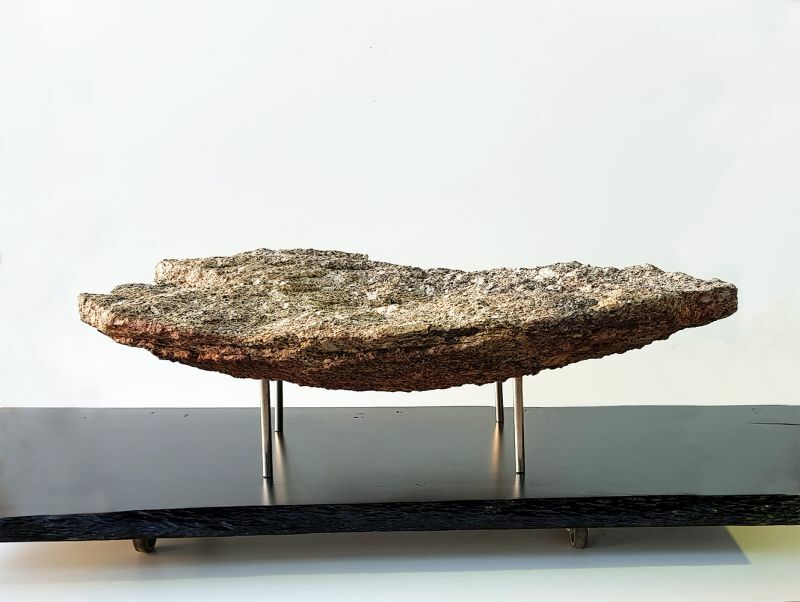 For me there is a wonderful connectivity between antiquity (chaise) and the Raw Rock table sculpture from architect and furniture designer, Frank Böhm, whom I enjoy working with. 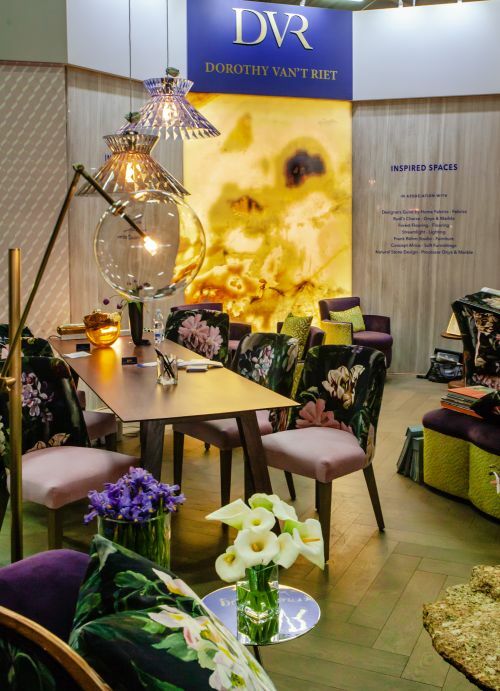 His unique pieces added another layer of creativity to my Designer Spotlight Stand at Decorex. 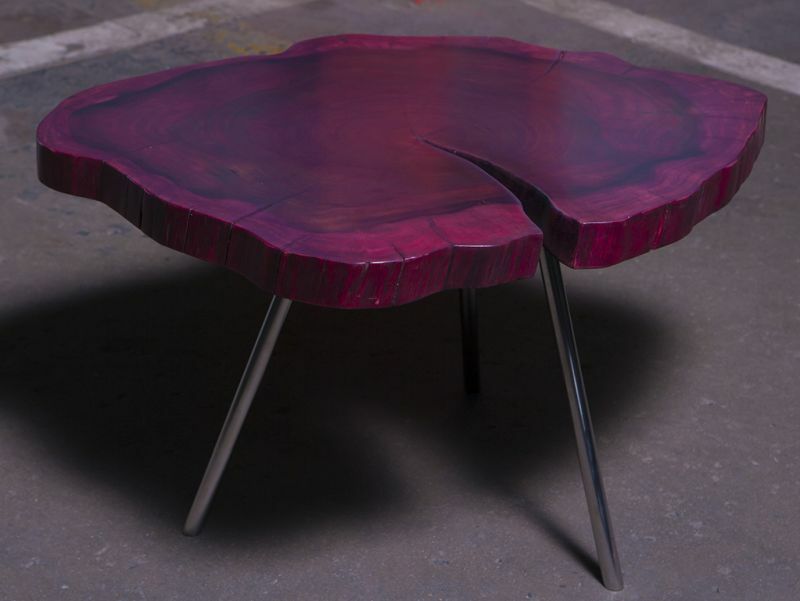 The trend is for furniture to be lived with and tactilely handled, with texture and touch going hand in hand. Giant patterned flowers and plants are even bigger this year, adding life and energy to a design scheme. Living plants are seen hanging with shapes. 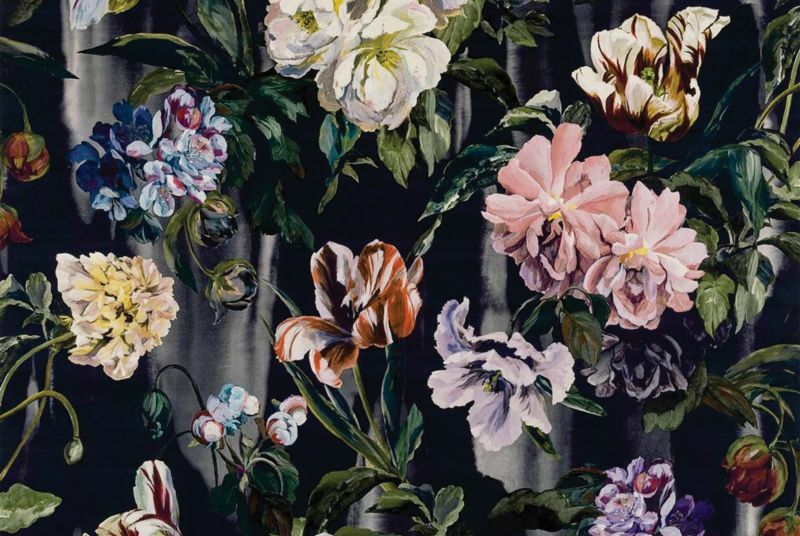 The need to counteract our increasingly urban lives can be seen with people reconnecting with nature, spilling over into wallpaper and fabrics.